It’s certainly validation for all of the hard work our team’s been doing, but more importantly it serves as motivation to keep raising the bar and investing in ourselves – to become an even better partner to our clients. App Partner is pleased to announce it has been named a top 5 Custom Software Developer and a top 15 App Development Company in New York City, by Clutch.co, a leading B2B research company that identifies top software and professional service providers. To see the full list of top NYC Custom Software Developers, click here. To see the full list of top NYC App Development Companies, click here. The company works with clients to guide them through the entire app development process – from conceptualizing and design through programming, testing, submission and post-launch support and app updates. App Partner’s collaborative, communication-driven process has resulted in the successful launch of more than 200 mobile apps. 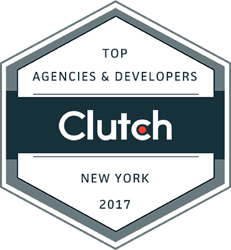 A B2B ratings and research firm, Clutch covers agencies and developers spanning multiple cities and countries, with a significant portion of companies hailing from New York. Their ongoing research features nine industries specifically, identifying the leading organizations of each.